DVD cover is © Warner Bros. and are used without permission under fair use for the purpose of criticism and review. This is an oddity among Robin Hood films, but one I found delightful. 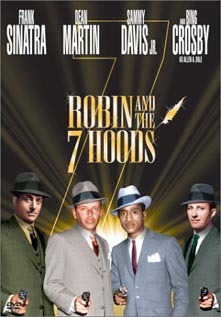 Robin and 7 Hoods updates the legend of Robin Hood by placing it in gangland Chicago. The Robin Hood legend translates surprisingly well to its new surrounding, especially when played for laughs. Many traditions are overturned, like having Robbo reduced to poverty at the film's end. As he's chased out of his office by a women's league, Robbo declares "I can fight hoods, I can fight crooked cops, but I can't fight the people." For hundreds of years the legend has been reforming Robin Hood. It's interesting to see him played as a gangster. In many ways, that's exactly what the original Robin Hood was. However, because the film is a comedy and he has a social conscience of sorts, it is still "safe". My favourite scene has to be when Robbo rebuilds his club to make it "knock-proof". The deputy sheriff and Gisborne try to raid the place on opening night. But a lever is pulled. Walls turn around, tables flip over. And when the police come busting through the door, all they find is a revivalist meeting singing about the dangers of alcohol. It's a trick worthy of the original Robin himself. I also like Gisborne's calls to the stone mason. Apparently a kidnapping scene was filmed, but cut because Sinatra's own son was kidnapped before the movie's release. New songs were composed by Sammy Cahn and James Van Heusen. My favourite song is the Crosby-led "Mr. Booze" from the above-mentioned revivalist scene. But the most memorable for Sinatra fans would be "My Kind of Town". I'm not a huge fan of musicals, and I'm even less of a Sinatra fan. But I still enjoyed this movie. I don't think it's going to have a lasting impact on the legend. It doesn't need to. It was fun. For more information on Robin Hood movies and television shows, visit the Films and Fantasy section of my History of Robin Hood.